How to ground systems based on digital sensors? 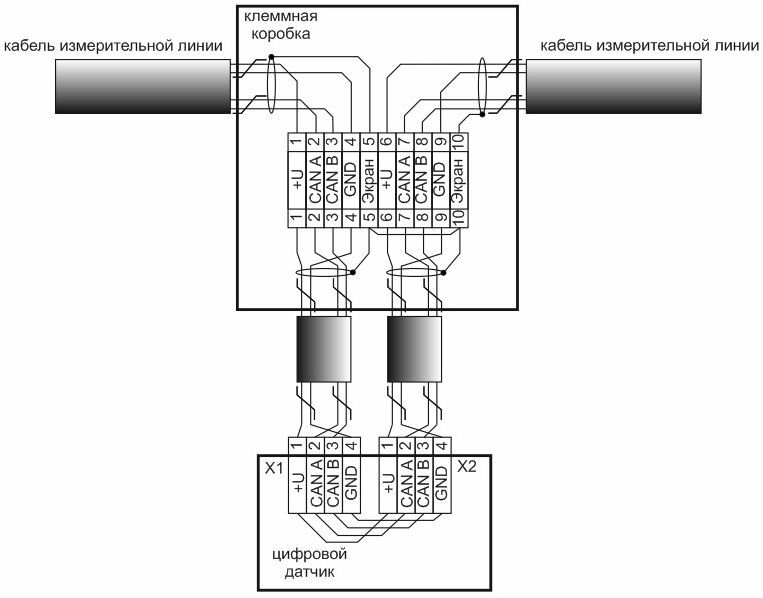 Digital sensors in industrial version have two jacks for cable line connection (Х1, Х2), which facilitates their direct integration into a cable line without terminal boxes (see Figure 1). The cable shield in jacks at both ends must be connected to GND circuit. In some cases, typically when using cables with large cross-section (with outer diameter over 8 mm), terminal boxes are required for building long measuring lines (see Fig. 2). In this case, the shields of cables at their ends are not connected to GND circuit, but are transmitted via separate terminals located in terminal boxes. When using a cable with armor, add into terminal boxes the additional terminals through which similar to the Shield circuit the Armor circuit will be transmitted. Pay attention to the fact that in the digital sensors the shunting of only four circuits is made between jacks X1 and X2, that is why the shunting of the Shield and Armor circuits must be made in the terminal box itself. At the interface converter location (it is typically located in the cabinet of receiving and recording equipment – RRE), a safety ground bus and a digital ground bus is required (see Fig. 3). The following elements are connected to the safety ground bus: external grounding, grounding terminal of the RRE cabinet case, grounding circuits of RRE cabinet equipment with power supply from 220 VAC 50Hz mains. 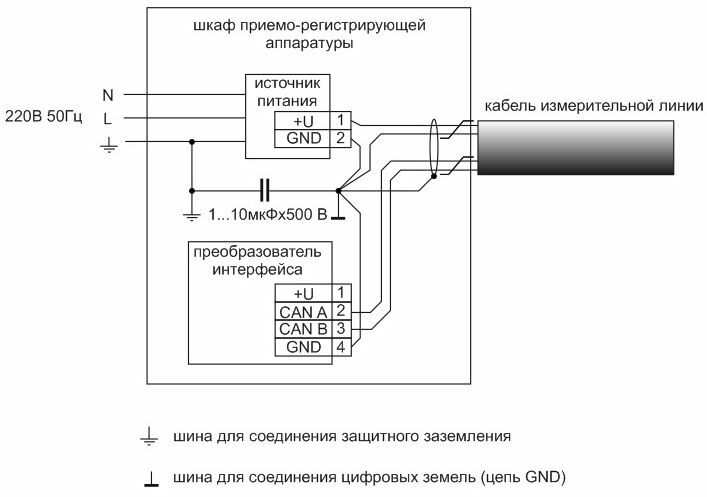 Output grounds of power supply sources and interface converters, as well as GND circuits and the Shield circuits of cable line are connected to the digital ground bus. Note that when using the armored cable, the Armor circuit must be connected to the safety ground bus in the RRE cabinet. It is necessary to place a capacitor with capacity of 1-10 mF and voltage not less than 500 V between the safety ground bus and the digital ground bus. Note: the figures show example of grounding for a line with CAN interface, grounding for RS485 interface is similar.